HFN was retained by the Centre for Surgical Invention and Innovation to evaluate the design of an image-guided breast tumor biopsy robot. 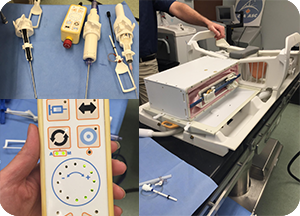 A task analysis and a series of cognitive walkthrough evaluations with radiation technicians and radiologists were conducted to identify design improvements to the physical hardware design, interface design and workflow. The recommendations from HFN’s analysis supported changes to improve patient safety, efficiency and the overall user experience for both patients and clinical staff.